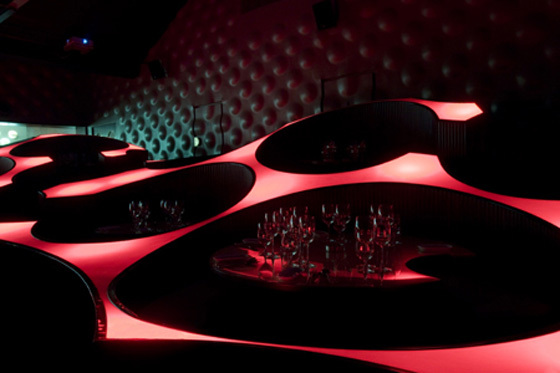 Located in Mumbai, India is the Blue Frog Lounge. Designed by Angle-Indian architects, Serie, the space includes a club, restaurant, lounge, sound stage, recording studio and sound lab, all encased within 1,000 square-meters of an old warehouse in Mumbai’s mill district. 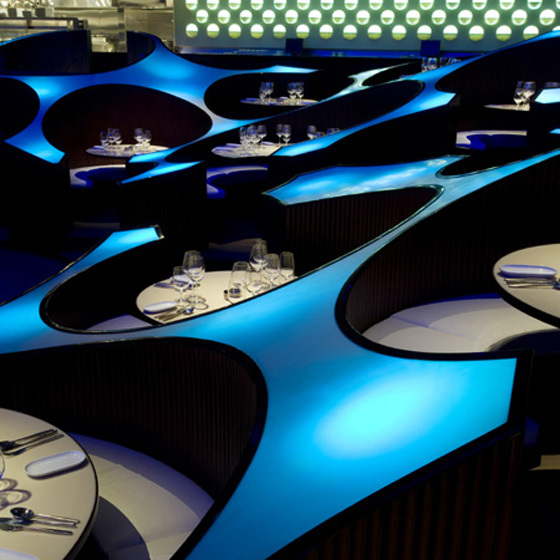 To create uninterrupted views of the stage, the booths, which are circular in nature and seat between 4 and 10 people, vary in size and are staggered in height. The undulating shapes are created from block board finished with mahogany and topped with back-lit 8mm acrylic sheets. The ambiance created by the colored lighting unifies the space, while not distracting from shows taking place on the stage.